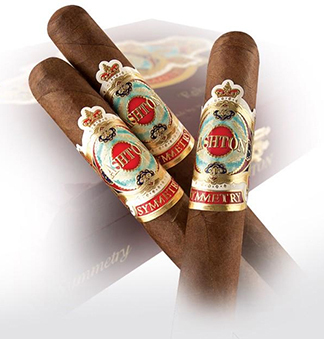 The Ashton Symmetry is the newest addition to Ashton's long line of award-winning cigars blended and produced by Carlito Fuente Jr. at Tabacalera A. Fuente y. Cia in the Dominican Republic. The Symmetry is a medium- to full-bodied handcrafted cigar that owes much of its character to a magical blend of tobaccos from Chateau de la Fuente, Villa Gonzalez, and a Fuente family farm in Esteli, Nicaragua, called Un Buen Vecino. Blended with Dominican and Nicaraguan fillers and a Nicaraguan binder wrapped in a beautiful Ecuadoran Habano leaf, these deliciously rich and creamy, smooth and balanced, soft-pressed cigars offer notes of oak, toasted nuts, and spice. Four years in the making and a decade since Ashton's last release, you'll see why Symmetry was so aptly named and well worth the wait.